As the end of the 2018 year comes around, it is time for RMU Sentry Media to reflect on the year that was, all the biggest moments and some of the most shocking defeats. But what 2018 did give us was some of the most thrilling and feel-good stories which will forever be etched in RMU history forever. So without further adieu, here are the top five, Robert Morris sports stories from 2018. It appeared that the winter sports season for Robert Morris was going to be a really good one. The women’s basketball team put up their best non-conference and their best overall record, men’s hockey – despite the tough finish to the regular season – had found themselves in Rochester for the fifth straight year for the Atlantic Hockey Final Four and women’s hockey was blowing away the competition with Brittany Howard absolutely dominating her way to Dapper Dan Sportswoman of the year (Don’t worry we’ll get to that later). It appeared to many that this year would see three different teams make the NCAA tournament in a nearly unprecedented fashion. But as fate would have it, it would be just the opposite. After playing their way to co-NEC champions with in-state rival Saint Francis, the two teams which were by far the best in the conference during the 2017-18 season met in the NEC championship in Loretto, Pa. But what the Colonials couldn’t be ready for was Jessica Kovatch. Kovatch, who is now the all-time leader in scoring in the NEC, put on a absolute show, scoring 29 of the Red Flash’s 66 points en route to a 66-56 conference championship victory. Charlie Buscaglia would fall one win short of his second NCAA tournament appearance in as many seasons as the head coach. Men’s hockey’s season, while not as great as a whole, was even more thrilling when it came to postseason play. Once again, head coach Derek Schooley proved why he has been a mainstay at RMU since the program’s inception. After claiming one of their lowest seeds ever in the Atlantic Hockey tournament, the team paved their way all the way to the AHC championship game after a thrilling OT game-winning goal from Michael Louria against Mercyhurst. But then came Air Force. The Falcons jumped out to a commanding 3-0 lead in the first period, and from there, the likes of Air Force goaltender Billy Christopoulos was just too much for the Colonials as their season ended in a 5-1 defeat against the Falcons in Rochester. And finally, with Brittany Howard and Jaycee Gebhard leading the offense, Elijah Milne-Price having the best season ever for an RMU goaltender and Kirsten Welsh continuing as a dominant force on the defense, the Colonials appeared poised to make the NCAA tournament for the second straight season. But much like the other two teams, there was one that stood in the way of Robert Morris. This time, it was the Mercyhurst Lakers. After taking a 2-1 lead after the first period, the Lakers took the wheel and completely took over, scoring three unanswered goals in the second period to go up 4-2 going into the final period. And despite the historic years from many of the Robert Morris Colonials, that third period deficit was enough to end their season, perhaps the biggest shock of 2018. 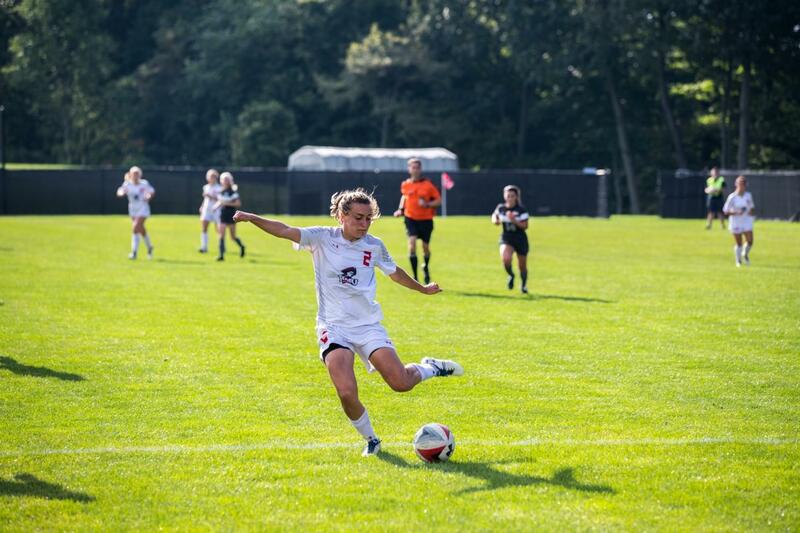 Although it may not have been a fantastic year for RMU women’s soccer, Jane Schleicher put up video game numbers for the Colonials in one of the most dominant seasons in the program’s history. Schleicher’s season started off with a game-winning goal with just 24 seconds remaining in the season opener against UMBC and continued on as she finished with 13 goals, the second-most in a single season in school history. Her 0.72 goals per game were good for the best in school history as well. Not only was she dominant, but an absolute workhorse for the Colonials as she played all but 26 minutes on the season. All of this capping a historic three years as a Colonial – she transferred from West Virginia Wesleyan – as she finished third in career goals with 24 and third in career points with 52. The storyline next year for the Colonials will be how they intend to replace 63% of their scoring from 2018. An easy argument can be made to put this at number one on the list, but we’re going to slot it at number three simply because the first two are achievements that rarely happen to a school like Robert Morris. Seemingly out of nowhere, Dr. Craig Coleman announced on November 12th of this past year that he will be stepping down from both his positions as director of athletics and RMU softball coach on December 7th. Dr. Coleman was the softball coach since 1991 and became the director of athletics in 2005, spending 13 years at the position. During his tenure, RMU athletic teams have claimed 24 regular-season championships and earned 16 automatic berths to the NCAA Tournament. His softball program claims six NEC tournament championships and eight NEC regular season titles. Senior associate athletics director Marty Galosi has taken over Dr. Coleman’s responsibilites while the university conducts a search while Assistant softball coach Jexx Verner has been named interim head coach. RMU women’s hockey senior Brittany Howard began her 2017-18 season already in exciting fashion as before her season even started, Howard was drafted by the Buffalo Beauts of the National Women’s Hockey League(NWHL). Howard went as the 10th overall pick in the NWHL draft as one of the league’s top prospects. She continued the year with absolute dominance as well. She finished her season with 25 goals and 24 assists on the season, including her most notable goal of the season when she scored the game-winning OT goal against #5 Ohio State. Her play was not only marked by dominance, but coming in during the game’s biggest moments. Howard would finish her career as the all-time leader in Points, points per game, goals, game-winning goals, goals per game, assists and plus/minus. Safe to say that Howard will hold some records for quite some time. And to cap it all off, her performances were not taken lightly by the Pittsburgh sports community as she was awarded one of the citie’s most prestigious awards as Howard was named Dapper Dan Sportswoman of the year alongside Pittsburgh Penguins all-time great Sidney Crosby, who was awarded Sportsman of the year. 2018 was certainly a year to remember for Brittany Howard. Of all the really incredible stories from Robert Morris sports in 2018, the best and most feel-good story had to be the incredible run of RMU men’s lacrosse. This was a program that in its’ entire history, had never made the NCAA tournament and that had not even won a NEC tournament game since 2013. After starting the season 1-2, the Colonials won five straight and even earned themselves votes in the national poll. The Colonials finished the regular season going 4-2 with their two losses coming against top conference foes St. Joseph’s and Bryant, which would happen to be the two teams they would face in the NCAA tournament. Robert Morris shocked the NEC with their first round win against Bryant, a team they had not beaten in over five years. That would earn them a championship berth against No. 20 St. Joseph’s. And it was certainly a game for the ages. Going into the half, St. Joe’s was up 6-3 on the Colonials with RMU needing a quick turnaround in the second half. Robert Morris came out firing in the third quarter and their defense executed perfectly with Alex Heger holding strong in net as he had all season long. The Colonials outscored the Hawks 5-0 in the third quarter and held an 8-6 lead going into the fourth. That was when the Hawks got themselves back into the game. St. Joseph’s outscored the Colonials 2-0 in a hotly contested fourth quarter and with the score tied at 8-8, this championship match would be headed to overtime. With the clock winding down in OT, it was Tyson Gibson who sent home the last-second game-winning goal as RMU stormed the field and claimed their first-ever NEC tournament title. The Colonials drew a bid against the Canisius Golden Griffins in the NCAA play-in game, one that many thought should have been hosted by the Colonials since they had already defeated the Griffins once this season. But despite that, Robert Morris came into Buffalo, and without their star goalkeeper Heger in net – he was out due to an undisclosed reason – the Colonials came out with the dominant 12-6 victory and the right to play No. 1 Maryland in the first round of the NCAA tournament. The Colonials headed into this match-up with virtually no expectations, but at halftime, there were stirrings of a potential all-time upset. It was some of RMU’s best lacrosse of the season as they saw scoring from five different players in the first half, while the Terrapins were held to just six shots on goal in the same half. Everyone around the sports world was talking while the Colonials went up 6-3 at the half, one more high-level half and the Colonials would of had the upset. But no matter how you slice it up, it is never easy going against the nation’s top team. Maryland came out in the second half scoring four-straight unanswered goals as they quickly regained the lead. They doubled their score in the third quarter alone, and went into the fourth holding on to a 9-7 lead. With 6:16 remaining, the score was still just 12-10 with the Colonials trailing close behind. But ultimately, the Terrapins proved to be just too much. Sneaking away from RMU’s valiant upset bid with the 14-11 victory. The Colonials almost did the impossible while capping off what was a historic 2018 season.